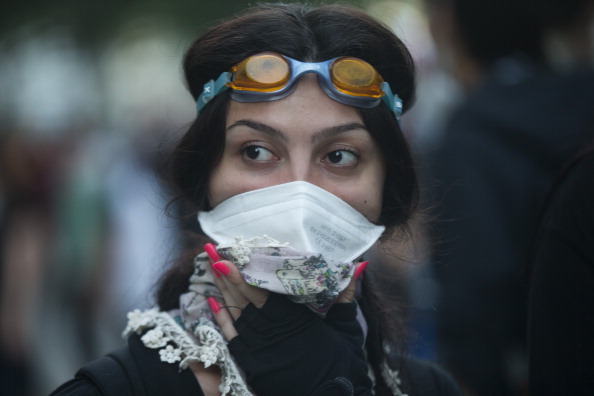 Police reportedly used tear gas on May 28 to disperse a group protesting the demolition of Taksim Gezi Park in Istanbul. This was just one of many recent instances where Turkish police have used excessive force to repress peaceful protests (Photo Credit: Bulent Kilic/AFP/Getty Images). Images of Turkish police employing shockingly excessive measures against peaceful demonstrators has once again highlighted Turkey’s willingness to stifle dissent as well as the impunity of its security forces. 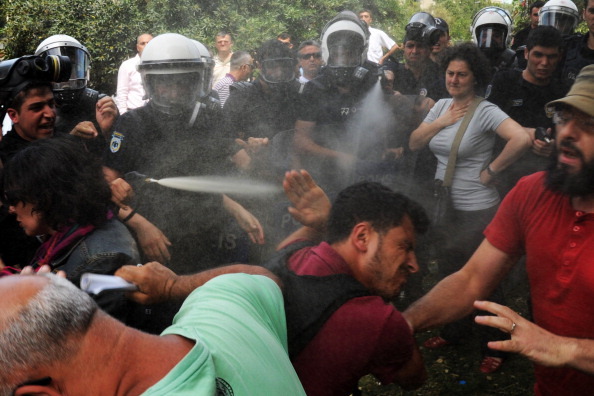 Protests which began with a few hundred activists protesting the destruction of one of the last green spaces in central Istanbul, have, in part as a response to images of police brutality, swelled to thousands. Further protests are scheduled not only for Istanbul, but for other cities in Turkey and around the world.. In a statement issued today, Amnesty has called on Turkish authorities to end its brutal repression of peaceful protests and initiate investigations into well-founded allegations of police brutality. 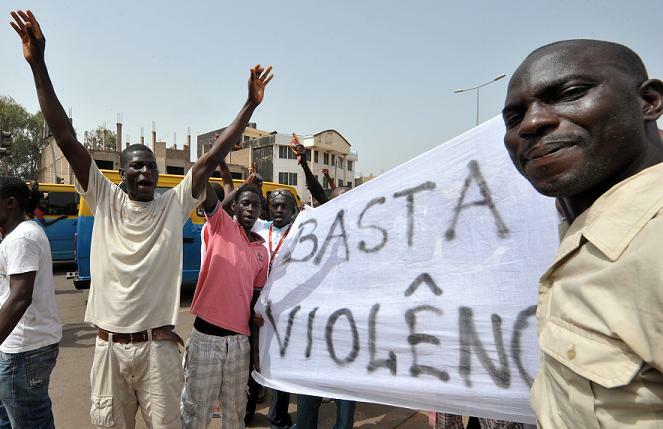 Demonstrating again the worst employment record for job security, members of the military staged a coup last week, arresting the president and prime minister, in the small, west African nation of Guinea-Bissau. Since independence, no democratically elected president has completed a 5 year term of office. Reacting to domestic and international condemnation, including suspension by the African Union, the army is becoming increasingly repressive of the basic rights of freedom of movement and expression, particularly of the media. There’s something wrong when on one hand Americans continue to stand up in support for Egyptians’ aspirations for human rights and on the other the US government supplies weapons to the very military regime that is attacking protesters. The Egyptian uprising is at a crucial point. A new cabinet is in power, a new parliament elected, but what it adds up to is all in the air, particularly with the military today making waves about how it will take a leading role in writing the new constitution. The American reaction, both governmental and popular, hasn’t been entirely helpful. The latest distraction is panic over whether Islamists will use their electoral power to turn Egypt into another Iran. Nicholas Kristof today presents a compelling rebuttal as to why Egypt will not take that route. Since protests demanding reform began on March 15 in Syria, hundreds have been detained or injured and more than 450 protesters killed by Syrian security forces. Members of the army and paramilitaries have shot into crowds of protesters and mourners using live ammunition, while snipers have shot and killed people in the streets and their homes and targeted medical workers and those helping the wounded. Although the Syrian government and the Syrian state news agency have attributed many killings to members of “terrorist” and “fundamentalist” armed groups, in the overwhelming majority of cases, the evidence clearly indicates that security forces of the Syrian government are responsible. Amnesty International has asked the Syrian authorities for permission to enter the country to investigate alleged human rights violations first hand. Ahead of a 2 April protest organized by opposition political parties through Facebook, the authorities have today detained at least 11 prominent political activists, echoing the pre-emptive methods they used to suppress protests on 11 and 12 March. The wave of arrests began on 29 March when Nazim Abbasli from the Azerbaijan Democrat Party was arrested and given five days’ administrative detention. Today two members of the youth wing of opposition party Musavat, Elchin Salimov and Rauf Mammadov, were arrested today by police and questioned about the 2 April rally. Elchin Samalov was sentenced to seven days administrative detention. Police have also questioned the family of Musavat member Idris Emiraslanli in an attempt to ascertain his whereabouts. Deputy Chairman of the Azerbaijan Popular Front Party (APFP) Ilham Huseynli, APFP members Karim Mehdiyev, Mehdi Mehdiyev and Nemat Aliyev, Classical Popular Front Party member Yagub Babanli, and youth activists Khalid Amanli, Rovshan Nasili, and Tabriz Qasimov were all arrested today and remained in custody this evening. In the meantime, pro-government figures held a spontaneous rally outside the home of opposition leader Ali Karimli. They chanted that he was a traitor and a homosexual, while police stood by and watched. While there are a number of detained and imprisoned activists in Azerbaijan, the case of journalist Eynulla Fatullayev stands out for priority campaigning. His articles have landed him charges of terrorism and treason, while he courageously continues his fight behind bars. Please click here for a sample letter to support prisoner of coscience and human rights defender Eynulla Fatullayev. On Friday Iraqis will take to the streets again in mourning over the 29 peaceful demonstrators who were killed last week in Baghdad’s Day of Rage. Among the protesters killed was a 14-year-old boy. As in previous protests, demonstrators will also demand political reform, an end to corruption, and jobs as well as clean water, food and electricity. In an effort to prevent demonstrators from reaching Baghdad’s Tahrir Square on February 25, bridges and roads leading to Baghdad were closed off, a curfew was set in place and Al-Maliki said on television that Al-Qaeda operatives might be shooting people at the protests. Thousands of soldiers and riot police were deployed in the streets of Baghdad on the days of protests. Later “forces fired water cannons, sound bombs and live bullets to disperse crowds,” according to the Washington Post. As February 25 approached Amnesty International and other human rights organizations called on the Iraqi government to respect the rights of protesters to assemble peacefully. Protesters who demonstrated before the Day of Rage had been attacked, beaten and stabbed by gangs. Besides the beatings, detentions and killings of protesters, Al-Maliki’s government detained around 300 peaceful demonstrators. Amnesty International USA is deeply concerned by Wisconsin Governor Scott Walker’s proposal to limit collective bargaining for most public employees to wages. If enacted, the Governor’s proposal would undermine the ability of unions in the public sector to protect workers, including by limiting workers’ ability to object to work conditions. Under international law, all workers have a human right to organize and to bargain collectively. These rights are an essential foundation to the realization of other rights, and are enshrined in the Universal Declaration of Human Rights, the International Covenant on Civil and Political Rights, the International Covenant on Economic, Social and Cultural Rights and the International Convention on the Protection of the Rights of All Migrant Workers and Members of Their Families, as well as conventions adopted by the International Labor Organization. Amnesty stands in solidarity with those seeking to defend collective bargaining rights anywhere these rights are threatened, and we urge Governor Walker and Wisconsin legislators to protect workers’ rights by rejecting any attempt to limit collective bargaining. We further call on the Governor to respect the right to peaceful protest and ensure that protesters are not intimidated or subjected to unnecessary or excessive force.